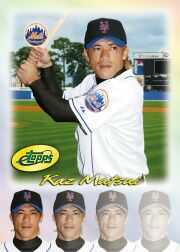 Topps, the historic baseball card maker, announces that it will issue the very first American baseball card of New York Mets Shortstop Kaz Matsui next Monday, April 12. The card will be sold exclusively on-line at www.etopps.com and will be available for one week only. Kaz's card will be limited to just 5,000 copies and will be available for $7.50 each. etopps, the only trading card offered exclusively on the internet, will offer 5-8 cards per week and will continue throughout the 2004 baseball season offering 90 players and 30 team cards in all. This week's offerings include Hideki Matsui, Mike Piazza, Jason Varitek, Hank Blalock, Eric Gagne and team cards of the Florida Marlins, Atlanta Braves and Los Angeles Dodgers. Only etopps cards held in personal on-line portfolios can be traded, sold or used in "Playing for Keeps". Portfolios are constantly updated to reflect the latest card prices on the etopps Trading Floor on eBay and consumers can track cards and market trends on the etopps Trading Floor Summary.